The geomagnetic field was unsettled to very severe storm on June 23 under the influence of CME effects. Solar wind speed at SOHO ranged between 485 and 717 km/s. 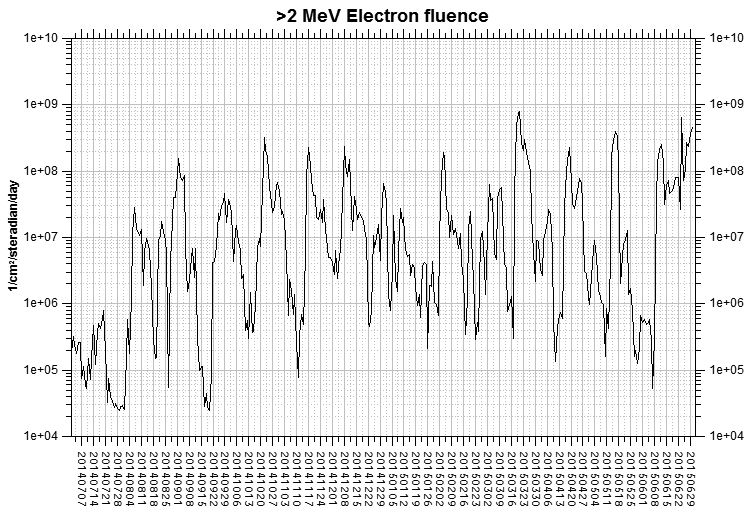 Solar flux at 20h UTC on 2.8 GHz was 116.1 (increasing 20.9 over the last solar rotation). The 90 day 10.7 flux at 1 AU was 128.5. 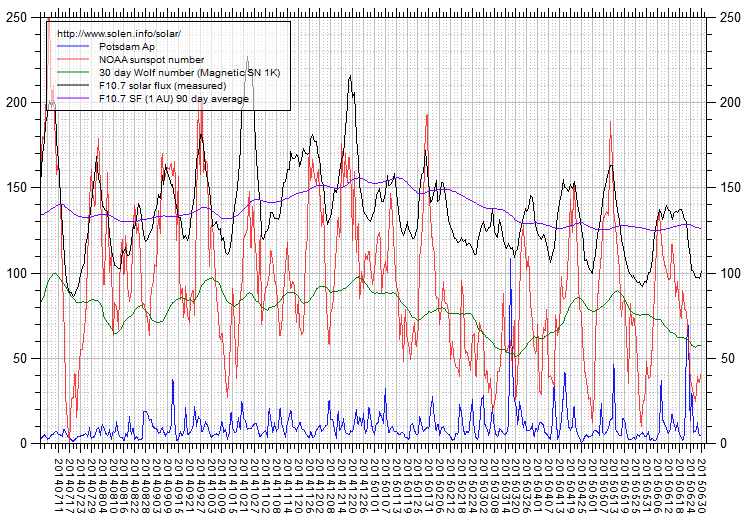 The Potsdam WDC planetary A index was 68 (STAR Ap - based on the mean of three hour interval ap indices: 68.5). 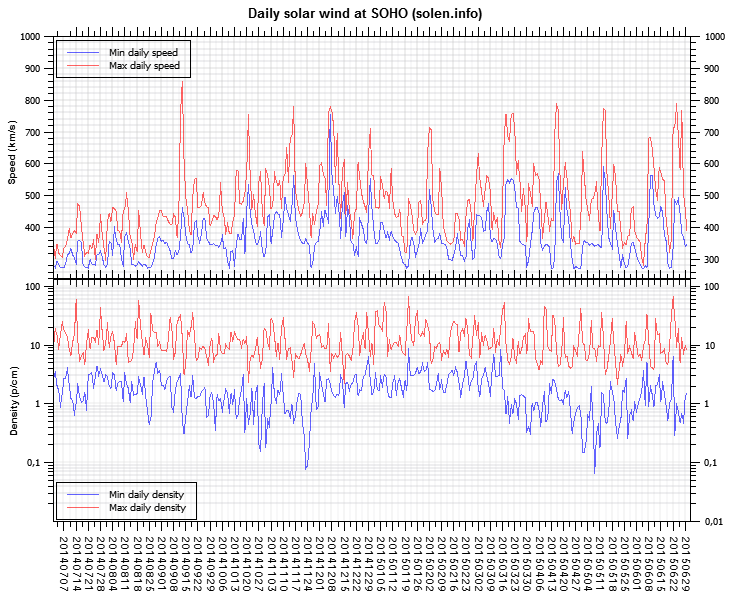 Three hour interval K indices: 78655344 (planetary), 67654343 (Boulder). At the time of counting spots (see image time), spots were observed in 2 active regions using 2K resolution (SN: 81) and 1 active region using 1K resolution (SN: 45) SDO images on the visible solar disk. Region 12371 [N11W24] decayed significantly as penumbrae fragmented into smaller parts and the large magnetic delta in the trailing spot section disappeared. There is still a small magnetic delta and an M class event is possible the next few days while the region decays. New region S4568 [N32E28] emerged early in the day, then decayed slowly. 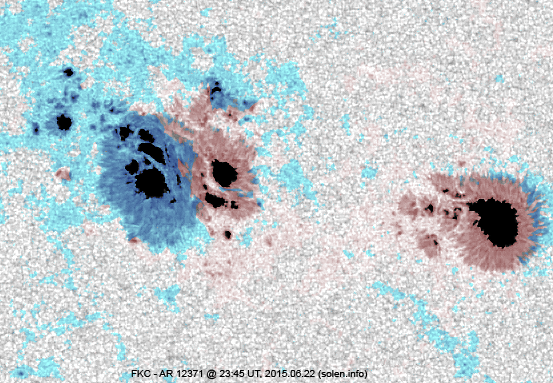 June 21: A halo CME was observed after an M2 flare in AR 12371 early in day. The CME reached Earth on June 22. 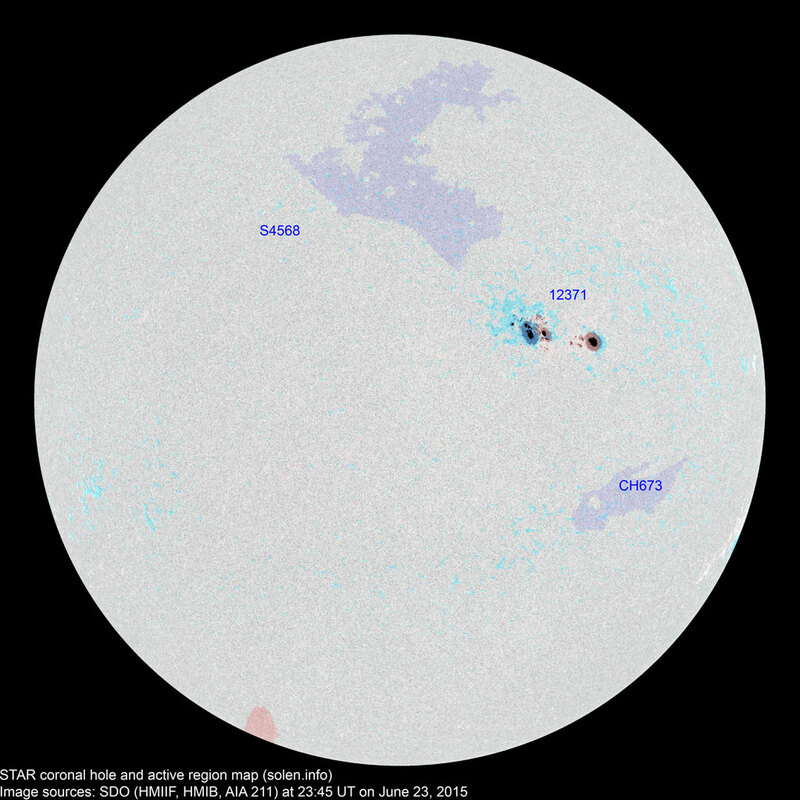 June 22: A full halo CME was observed in association with an M6 flare in AR 12371. 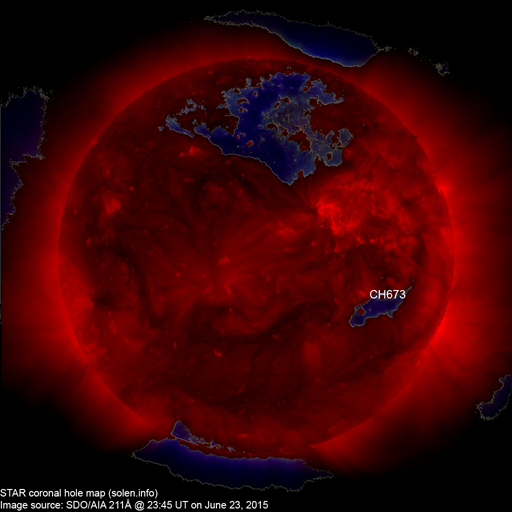 The CME could reach Earth on June 24. 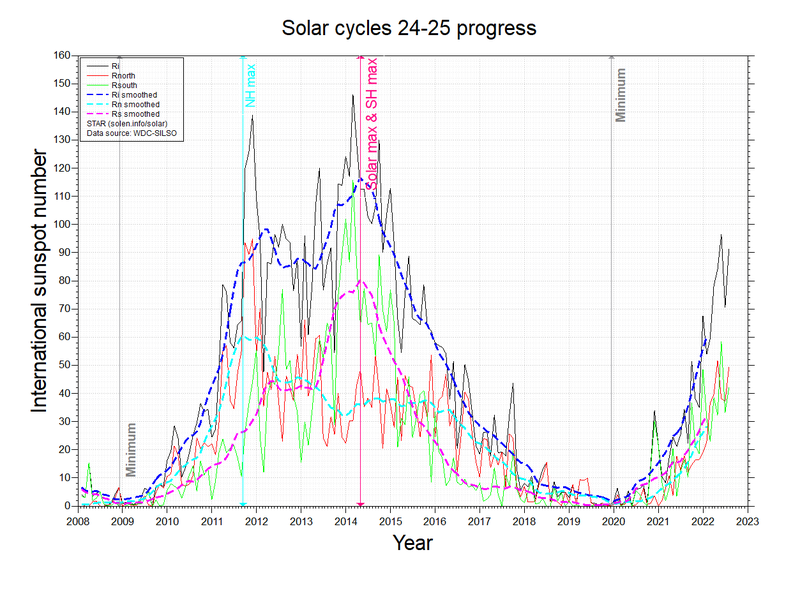 June 23: No obviously Earth directed CMEs were observed. The geomagnetic field is expected to be unsettled to major storm on June 24-25 due to effects from the CME which arrived on June 22 and the CME expected to arrive during the day. Quiet to active conditions are likely on June 26.